Hans Ebeling was an opening bowler and lower-order batsman who played just one Test for Australia, at The Oval in 1934. With three wickets and an innings of 41 he was unlucky not to play again, partly because Australia had no Tests in the following season, but before he died in 1980 he would have one much greater claim to fame – as the man who set the ball rolling for the Centenary Test of 1977. As vice-president of the Melbourne Cricket Club in the mid-1970s it was he who first proposed the idea of a one-off match between Australia and England to mark the 100th anniversary of what has come to be regarded as the first Test match. When James Lillywhite’s all-professional XI met the Combined XI of New South Wales and Victoria at the MCG on 15 March 1877 neither side could be regarded as full strength – there was no WG Grace after all, or Frederick Spofforth – but this time, injuries permitting, both teams would be truly representative, even if the Ashes were not at stake. Both countries had been busy in the previous few months – England had been touring India (where Tony Greig’s team surprised many by the ease with which they won the series) and Sri Lanka, while Australia had just returned from a short trip to New Zealand, having hosted Pakistan earlier in the season. It was during the first Test against Pakistan that Jeff Thomson, one of England’s tormentors from two years earlier, dislocated his shoulder in a horrific collision with team-mate Alan Turner. Although he would go on to tour England later in the year Thomson was unable to regain fitness in time for Melbourne – indeed, some believe he was never quite the same bowler after the injury. Only one debutant would appear in the Test, Turner himself having been dropped to make room for an exciting 21-year-old left-hander, South Australia’s David Hookes. A once-in-a-lifetime occasion such as this match had to be a true pageant of cricket. A special dinner was to be held during the match, and it was decided to invite all those who had represented either team in Tests in Australia, a decision which sadly left no room for those who’d distinguished themselves in Ashes contests in England, such as Bob Massie, but who for some reason had not appeared in the return series. Most of the old England players were able to make the trip, but Frank Woolley, almost 90 and living in Canada, and England’s oldest living Test cricketer, 91 year old ‘Tiger’ Smith were unable to do so. England’s senior representative was Percy Fender, 84, partially sighted and accompanied by his grandson; Australia’s was the 87 year old Jack Ryder. The home captain from the 1928-29 series was to die just two weeks after the conclusion of the match. England sprung one surprise in the days before the match, announcing that experienced opener Dennis Amiss, scorer of over 600 runs in six matches since his recall against the West Indies at The Oval, would bat at four. It left an inexperienced top three looking somewhat exposed, particularly since none of them had made many runs against India. If Australia, holders of the Ashes and playing at home, were probably most people’s favourites going into the Test, the form book had been somewhat upset by lunch on this first day, which they took at 67 for 5. Chappell and Marsh, captain and vice-captain, were still there but clinging on for survival as Lever and Willis, with two wickets apiece, and Old, who accounted for Hookes after a brisk 17, had made inroads into the batting. For McCosker it proved to be a painful ordeal. Trying to hook Willis he took a ball direct on the jaw, from where it deflected onto his wicket. He would spend the rest of the day in hospital having the resulting fracture treated. After the interval Underwood got into the act with three cheap scalps, among them O’Keeffe to a superb, full-length diving catch by Brearley at slip. Chappell had top-scored with 40 but once he went the end came quickly: 138 all out. An elated Greig led his team off. England had a few overs to bat that evening and lost Woolmer to a good slip catch by Chappell off Lillee; Underwood came out in his accustomed role as night-watchman. 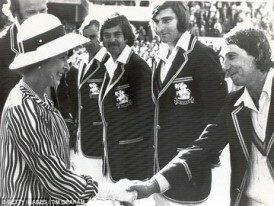 Eleven wickets on day one was certainly not what the organisers, boards and sponsors wanted – not least because the Queen, in Australia as part of her Silver Jubilee, was due to visit on the fifth day! I believe that this was the first overseas Test for which I listened to ball-by-ball commentary. It was on in the middle of the night of course for listeners in Britain, but a cricket mad 14 year old – along with thousands of others – set the alarm early to listen to play after tea. So it was with no little dismay that I switched on the crackling radio next morning to hear, not England building a healthy lead, but Australia batting again! Quite simply, the visitors had been blown away by Lillee – it was 1974 all over again, except that this time Walker, with four wickets, was the co-destroyer. No England batsman reached 20, and O’Keeffe and Gilmour were scarcely required. Australia lost three wickets before the close – O’Keeffe, opening in place of McCosker, Cosier and Chappell all out cheaply – but Davis and Walters were looking well set and in any case a first-innings lead of 43, in what was turning out to be a low-scoring match, seemed decisive. Twenty-three wickets had fallen in two days, and the wisdom of having a royal visit planned for the final day must have been reconsidered, but the match was now about to take a different course. Australia spent Monday building up a substantial lead. The overnight pair proceeded cautiously, Davis bringing up a 50, from 188 balls, in his first Test against England. It was the England captain who made the breakthrough shortly before the drinks break as the opener chased an outswinger to give a catch to Knott. Davis and Walters had added 79; the lead now an ominous 175. Now it was young Hookes, who’d switched places with Walters from the frst innings, who came to the wicket. He had forced his way into the side with some prodigious run-scoring for South Australia, which included a sequence of five hundreds in six innings: 163 and 9, 185 and 105, 135 and 156. He wasn’t even in the State side at the start of the season. Hookes stayed with Walters until lunch which was taken at 186 for 4. Walters was on 66, having been dropped by Old shortly before the break; this didn’t prove an expensive miss though as he went without adding to his score after the interval. So England now had two left-handers to bowl at, Marsh the new batsman. They might not have known much about Hookes but they knew all about Rod Marsh. A veteran of four Ashes series going back to 1970 Marsh had made an unbeaten 92 in his fourth Test, on this ground, and now had hundreds against Pakistan and New Zealand to his credit. But up till now no Australian wicket-keeper had made a Test century against England. There could be no better setting for history to be made. But at first all eyes were on Hookes. The youngster had made measured progress either side of lunch, going on to 36 from 110 balls or so. But then he cut loose against Greig. After defending the first two balls of an eight-ball over, he hit the next five to the boundary: straight drive, pull, cover drive, on-drive, cover drive. To Greig’s relief, Randall intercepted another drive from the final ball. Hookes fell in the next over, departing to a standing ovation. Gilmour stayed with Marsh just long enough to take the lead past 300, too many, surely, for a side which had only managed 95 first time round. Lillee, often dangerous in the lower order, saw Marsh to his 50, scored at a good lick from 77 balls, and the two Western Australians added 76, England wilting in the heat of the afternoon and starting to put down chances. When the eighth wicket fell the lead was almost 400, at which point the courageous McCosker, his face heavily bandaged, came to the wicket. Accompanied, slightly incongrously perhaps by O’Keeffe as a runner, he had insisted on being allowed to bat, with Marsh on 82 and perhaps the feeling that Australia weren’t yet safe. England kept the ball well up to him at first but as he grew in confidence, and took his own score into double figures, he started to get the odd short one. Australia closed at 387 for 8, a lead of 435, with Marsh still there on 95. On Wednesday, after the rest day Australia batted on for another hour. Marsh got to his 100 with a leg-glance off Willis and was able to celebrate for the second time in the match. On day two he’d overtaken Wally Grout’s record of 187 dismissals for his country. Chappell finally called them in at 417 for 9, leaving England around 11 hours to make 463 to win, many more than any side had made to win a Test match before. England again lost Woolmer cheaply, and once again the wisdom of making the Kent man open, a job he’d only done twice before in Tests, was called into question. At least Brearley and Randall were still there at lunch. They were there at tea, in fact. Brearley looked solid enough and the jaunty Randall, taking advantage of some good fortune, had just got to his maiden Test 50. He was especially severe on Gilmour, who it later transpired played in this match with an injured foot, and saw him taken out of the attack for good. The Nottinghamshire batsman had been a popular tourist in India but in none of his four Tests there did he make more than 37. It must have been a close call between him and Graham Barlow for the number 3 slot for this match. But the decision had paid off. He lost Brearley straight after the interval but Amiss, surviving chances off the toiling O’Keeffe and his old nemesis Lillee, stayed until the close, which came at 191 for 2. Randall was on 87, an unlucky number it’s said, but only for Australians. The story of that final day is so familiar, at least to some of us, that it seems almost otiose to relate it anew. Suffice to say that England came within striking distance of pulling off an astonishing upset. At one stage they were 346 for 4, needing another 117. Randall doubled his overnight score, took the Man of the Match medal ahead of the equally deserving Lillee and Marsh, and established his place in the England batting lineup for the rest of the decade. None of us knew that he’d have to wait two years for another hundred. In this innings he revelled in the occasion and the challenge, ducking bouncers from Lilllee, getting hit once or twice as well, doing a reverse roll and famously doffing his cap to the great bowler. It may have looked cheeky and perhaps it was, but not in a disrespectful way. When already past 150 he was given out caught behind, and was heading back to the pavilion when Marsh indicated that the ball hadn’t carried – an outstanding piece of sportsmanship applauded by Greig from the non-striker’s end. Of course Randall needed support, and the truth is that he had some, but not quite enough. Amiss went some way to dispatching his demons with an innings of 64, and Greig and Knott both got into the 40s, but Fletcher fell cheaply for the second time in the match – as much a passenger for England as Gilmour had been for Australia. Knott was batting with the tail for most of his innings and was last out, fittingly, to Lillee giving him eleven in the match. It was not long before spectators realised, to their incredulity, that the margin of victory was the same as in the 1877 match – 45 runs. As someone remarked at the time, Hans ‘Christian’ Ebeling could not have scripted it any better. The centenary of Test cricket got the match it deserved: this was a game with everything – two unexpected collapses, an auspicious debut, a display of great courage, a historic hundred, a breakthrough innings by a young batsman, a world-class display of fast bowling. Everyone left the arena either happy with the result or at least with honour satisfied; but within weeks it became known that one Kerry Packer, with the England captain Tony Greig, had used the occasion to recruit players for a project that would split the game in two before the year was out. A match that marked a century of Tests also, it seems now, drew the curtain on a bygone age.